Thirty-five percent of Chinese customers are already accustomed to purchasing luxury goods online, according to a white paper published by Tencent, Secoo, and Deloitte. Even when purchasing at traditional brick-and-mortar retail stories, Chinese shoppers will typically have explored their purchasing options online. E-commerce seems is shaping up to be a defining facet of luxury brands’ strategies in China in 2018, but each is handling the task very differently. In 2017, Gucci, Louis Vuitton, and Prada all launched their own online stores in China, integrating local payment solutions Alipay and WeChat pay. By creating an official buying channel, brands have total control over consumers’ digital experience, keeping it consistent with their brand image. They can also create an exclusive space to interact with consumers and in return, gain first-hand user behavior data from the site. On the other hand, if such stores aren’t done right, they could damage the brand. Accustomed to incredibly efficient online shopping experiences, Chinese consumers have complained that their experiences on a brand’s site were not ideal, and that discouraged them from further engaging digitally. Delivering an excellent digital experience requires serious investments of time and money—constantly monitoring customer experience and feedback, and ensuring digital efforts are in sync with other departments. The risk is that online shoppers are less interested in a perfectly curated experience than a lower price they can find elsewhere. One way to create an exclusive, high-end digital experience without building a site from scratch is to launch on a luxury e-tailer site, like Secoo or Vip.com. Brands pursuing this strategy include Tod’s on Secoo, Marc Jacobs on Vip.com, Loewe on Luxury Pavilion, and Saint Lauren on Toplife. Brands can sell directly to wealthy clientele, making it easier to accomplish a higher transaction rate. However, they also need to choose the platform wisely, testing the digital experience from start to finish and carefully selecting inventory that fit the platform. For example, Vip.com is known to offer deep discounts, while Secoo prides itself on providing a “five sense luxury experience” with the offering of offline experience centers. The most popular approach of late is to launch on major e-commerce platforms such as Tmall, and JD.com. Examples include Tag Heuer, Coach, Burberry, and La Mer on Tmall, and Chopard, Zenith, Armani, and Swarovski on JD.com. This strategy can gain brands more exposure without requiring a large investment of resources. But these platforms are also considered mass-market and are filled with counterfeit items, diminishing luxury brands’ exclusivity by association. In addition, the majority of consumers on these platforms are price-sensitive, requiring brands to deploy a discount strategy to capture their attention. 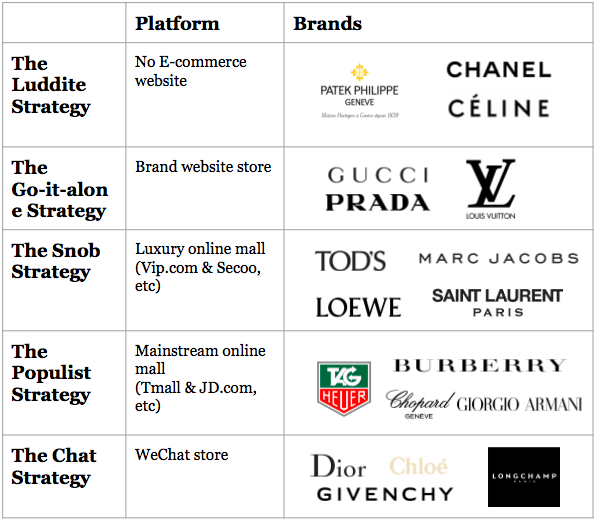 Walking the thin line between exclusivity and availability, many brands carefully craft an e-commerce strategy not on an e-commerce website, but through WeChat. Pop-up sales, limited edition items, and Valentine’s Day-only exclusives are some of the marketing techniques frequently deployed by luxury brands. Dior, Longchamp, Stella McCartney, Cartier, Givenchy, Chloe, and Valentino are all active in this space. Many of the brands we listed in other categories have at least some presence on WeChat too. WeChat can feel more social and intimate, more like a real retail environment. In fact, WeChat has already been put to use in retail stores by sales associates. Many brands have devoted energy to developing an integrated online and offline strategy through WeChat. But because the primary function of WeChat is still social, it may not be a sustainable revenue stream. Brands shouldn’t treat WeChat as a final solution to profit-making, but a channel to build traffic and provide better services. For luxury brands, e-commerce is not a simple add-on. It requires integration with the entire digital marketing, sales, and retail teams. The one-stop strategy doesn’t always work for Chinese consumers, as their purchasing journeys are disparate. To truly create a customer-centric, omnichannel, high-end experience, while serving the young consumers and expand geographic reach, we are seeing more and more brands deploy a combination of the strategies mentioned above.